There are a lot of apps out there that promise to change your life for the better, whether that means losing weight or thinking positively or even meditating more. The self-help industry has jumped on the app revolution perhaps harder than any other one industry has so far. Some of the results are truly life changing. In order to participate, users create an action, take a picture, and then share their thoughts about the action. From there, the community can comment and encourage the person, so that the focus on making changes is about positivity instead of negativity. So, for example, a person trying to lose weight might hear “Hell yeah!” from the YOU-app community when they walk a mile, whereas a traditional weight-loss coach might tell them that they should have walked two. 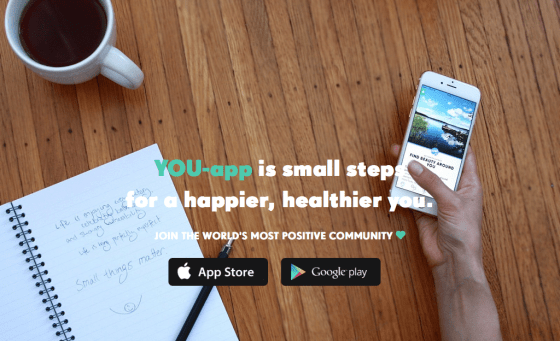 Studies have shown that positivity works better than negativity when it comes to making healthy life changes, so stop beating yourself over eating that burger and celebrate taking the stairs again instead, with the awesome community on YOU-app.